Evidence of Zika virus found in tears, may persist in eyes. Zika virus is a mosquito-transmitted flavivirus that is closely related to Dengue, West Nile, and yellow fever viruses. Zika virus causes mild disease in most adults and can cause brain damage and/or death in fetuses. About a third of all babies infected in utero with Zika show eye disease such as inflammation of the optic nerve, retinal damage or blindness after birth. In adults, Zika can cause conjunctivitis, redness and itchiness of the eyes, and in rare cases, uveitis. However, ocular pathology has not been assessed. Now, a study from researchers at Washington University School of Medicine in St. Louis shows that the Zika virus can live in eyes and have identified genetic material from the virus in tears. The team state that their findings in mice, helps to explain why some Zika patients develop eye disease including a condition, known as uveitis, which can lead to permanent vision loss. The opensource study is published in the journal Cell Reports. Previous studies show that the eye is an immune privileged site, meaning the immune system is less active there, to avoid accidentally damaging sensitive tissues responsible for vision in the process of fighting infection. Consequently, infections sometimes persist in the eye after they have been cleared from the rest of the body. The current study investigates Zika infection in the eye by using recently developed mouse models of pathogenesis. 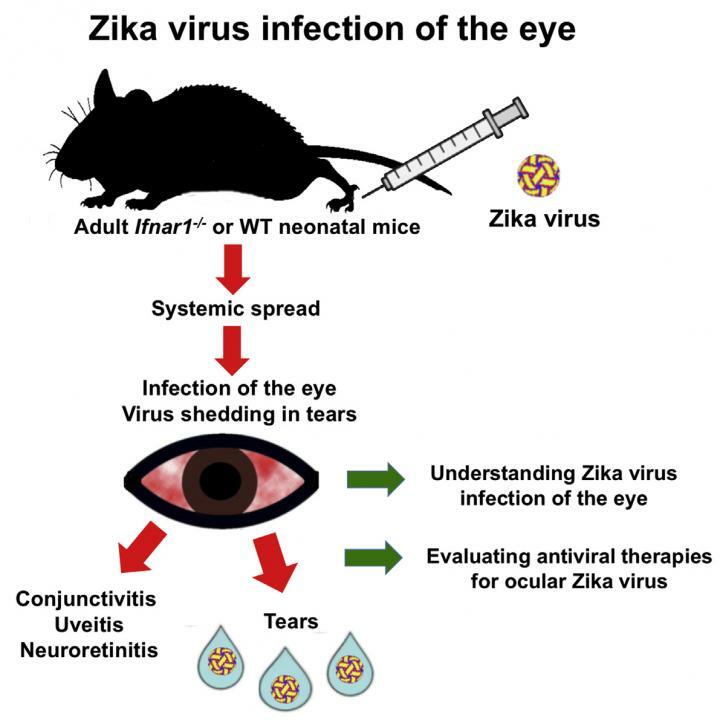 The current study utilises mouse models of Zika infection in adults to show that the virus can infect specific regions of the eye, resulting in uveitis and conjunctivitis, a symptom observed in 10%-15% of human patients. Results show that viral RNA was detected in rodents’ tears after the virus had been cleared, raising the question of whether Zika continues to replicate in the lacrimal gland, where tears are produced, or the cornea, outside the reach of the immune system. Data findings show that any signs of eye disease appeared within 7 days after being injected with the virus. Results show that mice developed conjunctivitis and inflammation of the uvea, where the iris and retina are located, as well as the optic nerve, which is rare in Zika-infected humans but has been reported. The lab note that it is still unknown how the virus enters the eye, with possible routes of ocular infection hypothesized as transmission of the virus from the brain along the optic nerve and into the eye. They go on to add that the virus may invade the eye by crossing the blood-retina barrier; another possible route, known to be rare and possible for Ebola transmission, is to enter the surface of the eye via tears. The group state that eye infection raises the possibility that people could acquire Zika infection through contact with tears from infected people. The researchers observed that the tears of infected mice contained Zika’s RNA, the genetic material from the virus, but not infectious virus when tested 28 days after infection. The lab stress even though the live virus wasn’t identified in mouse tears, this doesn’t mean that it couldn’t be infectious in humans. They go on to add that there could be a window of time when tears are highly infectious and and able to spread via this avenue. The team surmise that their findings establish Zika virus infects specific target cells in different regions of the eye and gives a model for the development and testing of treatments for acute and persistent viral infections in the eye. For the future, the researchers state that even if human tears do not turn out to be infectious, the detection of live virus in the eye and viral RNA in tears still has practical benefits. They conclude human tears potentially could be tested for viral RNA or antibodies, a less painful way to diagnose recent Zika infection than drawing blood. This visual abstract the findings of Miner et al., who describe how ZIKV infection in the eye results in inflammation and injury. ZIKV infected the iris, cornea, retina, and optic nerve and caused conjunctivitis, panuveitis, and neuroretinitis in mice. This manuscript establishes a model for evaluating treatments for ZIKV infections in the eye. Credit: Miner et al./Cell Reports 2016.